This week we're finding books with songs, rhymes and dancing. We recently had the opportunity to check out some books from Sterling Publishers. These are two of their new releases and are a more unique variety than I've seen before, which I always enjoy because it gives me something unusual to browse through. 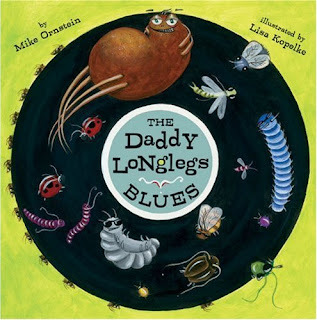 "He's a Daddy Longlegs . . . He digs dank, dark spaces. He brings rhythm and soul to gloomy places. Just get mellow to the bellow of his saxophone. He's the world's most rhythmical opilione. It reads that way throughout the whole book which is rather catchy, really. My one and only objection to this book is that it repeats the refrain "Shake your booty" which is something I really never want to hear fly out of the mouth of my 2 1/2 year old (or, for that matter, my five year old when he turns five, or a ten year old or at any age). But since my 2 1/2 year old can't read, I just skipped that line and all was well! Bookworm1 loved inspecting the insects. (I've talked about my love of insects before.) This book would be a fun addition to a study on insects. It's different. It's lyrical. It's cute. It has dancing lady bugs and as far as Bookworm1 is concerned, that's about all that it needs. Bees play the harmonica, flies play drums. "Creepin' and a crawlin', no stop, stop, stoppin.'" Like I said, it's a bit different and unique and I imagine it would be a crowd pleaser. 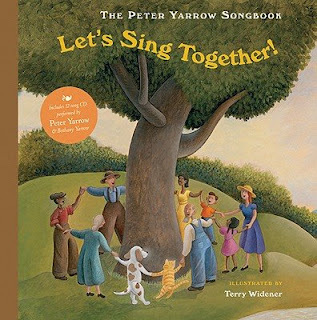 The second book we got to look AND listen to is The Peter Yarrow Songbook: Let's Sing Together! When I was growing up, my best friend and I would go into her grandmother's closet and pull out the old Reader's Digest Songbooks and peruse them for HOURS. No, I have no idea why. I don't recall that we actually sang any of the songs outloud. We just looked through them and we had tons of fun doing it too. (Again, no idea why.) Let's Sing Together! rebirthed that old memory as it reminds me very much of those books, except that it is far better illustrated (by Terry Widener)! This Songbook is very folksy including a good sampling of children's favorites. She'll Be Coming 'Round the Mountain (six verses! ), Home on the Range, My Bonnie Lies Over the Ocean and even John Jacob Jingleheimer Schmidt is included! It's a very low key song book that comes with a CD so that you can just listen to it or listen while you read along with the book. Each song is illustrated and in the back of the book there are chord charts for people who would like to "pick" along with the book. However, even though he provides the chord charts, he encourages 'his fellow pickers' to explore and experiment with the chord patterns, arguing that each artist must interpret the music as he or she sees fit. Peter Yarrow really designed this book so that children would be a.) drawn to folk music and b.) would have fun being creative in their own right. Again, Terry Widener's illustrations are quaint and "down home," for lack of a better phrase. The colors used are very gentle, giving this book a very calm feel. Definitely an interesting collection of songs and, as I said, it kinda beats out those old Reader's Digest songbooks . . . although nothing can quite replace those memories! That songbook looks especially good--I'll have to look it up. My Louise LOVES to sing. These books look like fun! I'll check them out.